SHARJAH- As the cooler month’s approach and the summer season releases its grip on outdoor activities, the Mleiha Archaeological Centre in Sharjah is opening the doors to its desert retreats. From the magic of the setting sun over rolling dunes to the mysteries of the cosmos in a cloud-free sky, Mleiha offers a unique chance to rest, relax and reflect. As part of the new Diamond Lounge experience, guests will travel in luxurious off-road vehicles, enjoying a gentle desert drive to the venue in time to witness the sun as it sets behind the horizon, followed by delicious snacks and bites or traditional Arabian beverages to celebrate the surroundings’ beauty. In a personalised package, visitors can treat themselves to silver service dining in a canopied Majlis setting, with a five course dinner and live grill before exploring the wonders of the universe through high-powered telescopes in the company of an expert astronomer. For those looking to enjoy a relaxing escape for the entire family and friends, the Sunset Lounge next to the Fossil Rock also begins with a breath-taking sunset view, followed by a trek around the rock and a barbeque dinner under the stars with a stargazing experience. to discover deep space objects and galaxies. 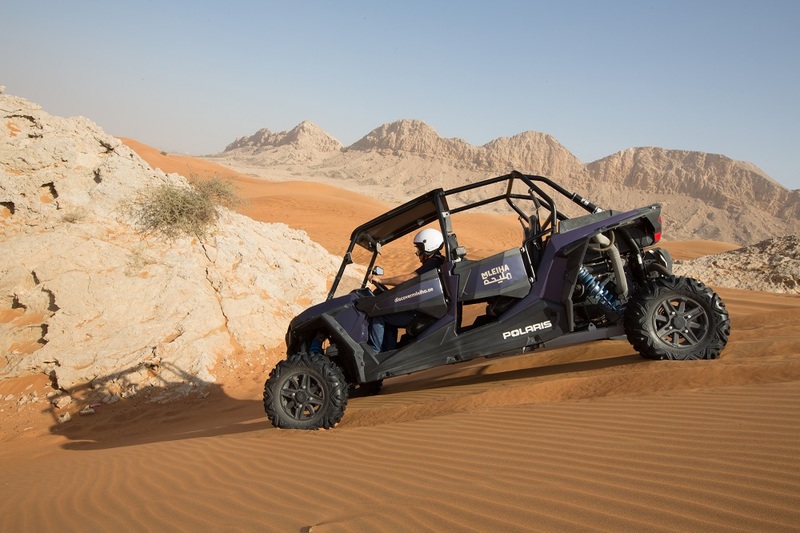 Although the four hour package includes a short off-road dune drive, more adventurous desert explorers can enhance their experience with a thrilling buggy night adventure. The Overnight Camp is a true escape-from-it-all journey, including a magical night camping under the stars. It is the perfect getaway for those seeking an authentic desert experience, with a trip deep into the dunes, and a chance to explore in details the night sky. The sunrise is accompanied with a delicious breakfast included in the package. For those captivated by the secrets of the universe, the Stargazing Experience offers guests an enlightening night studying distant galaxies, satellites and planets including Mars, Jupiter and the moon depending on their availability in the night sky. Mahmoud Rashid Al Suwaidi, Mleiha Archaeological and Eco-Tourism Manager said: “We live in a world where we often don’t have the time to realise the beauty and tranquility of our surroundings. We are incredibly fortunate to have such wonders nearby.